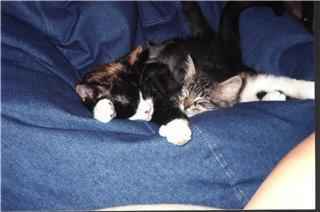 Molly and Scotty were adopted by Katie and Kendra, who write, "In early September 2001 my sister and I persuaded our parents to allow us to adopt Molly, a beautiful 1-1/2 year old calico with a sad background. Molly had been found next to a dumpster taped inside a box with food, water, a blanket, and very pregnant. "On September 15, 2001, Molly became an official member of our family. She was a perfect fit and soon, it felt as if Molly had lived with us forever. Molly was, and still is, spoiled and loved by everyone in the family. 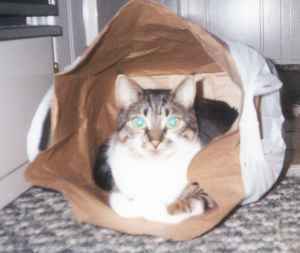 For 10 months, Molly was the "queen bee" of the house. But, in late July 2002, my sister and I once again fell in love with a feline. This time, we had fallen for a skinny, longhaired kitten named Prescott. Prescott, soon called Scotty, the Little Man, Dustbunny, and Spock (because of his ears), adores Molly, but unfortunately, for now, Molly can only tolerate him - half of the time. However, each day, Molly gets closer to accepting the fact that she is no longer an "only cat." From here forward, the future of our two cats looks bright." 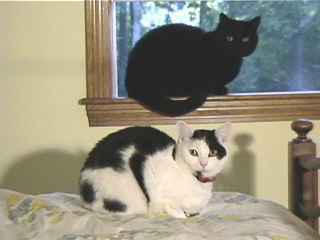 Ray sent us this picture of Oliver (top) and Holly (bottom). Holly had a scare recently - she had been ill, and the vet thought she might have a tumor. When she was operated on, it turned out that she had swallowed a twenty-inch long piece of elastic! Holly is now recovering well and will be fine. Mr. Bojangles is a complete Mama's Boy. 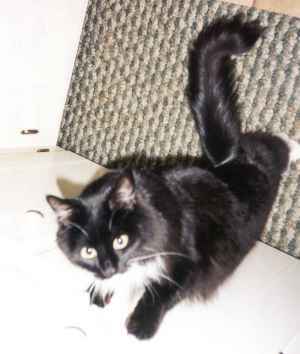 He was adopted by Janice and Stacy in 2000 when he was ten weeks old and has remained a kitten ever since. Rose, or "Zeeta" (short for Rosita) as she she prefers, loves to talk and make her presence known. She was adopted by Stacy and Janice in 1998 and is just as cuddly as ever.